For nearly 60 years SENCO has been synonymous with professional results. They work hard to deliver innovative fastening and power solutions that make tough work easier. With every fastener you drive, they strive to ensure you get the job done right. Aimed at the hardworking professional across many demanding work sites, they understand your performance and safety is key. As the needs of the tradesman evolves, they continue to pioneer innovative, new technologies, in both tool and fastener development. At My Tool Shed we have cherry-picked a core range of SENCO Screwdrivers, Nailers, Staplers and Compressors, stocked-up with the nails and staples you need for consistent productivity. Covering a wide choice of jobs such as: flooring, roofing, upholstery and furniture, decking, framing and more, SENCO have a quality solution to suit. 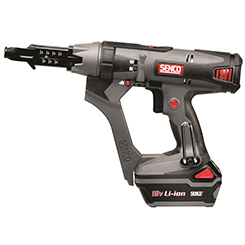 Shop SENCO from My Tool Shed and discover exceptional output from this highly regarded brand name.